Slow growth of grasses has been a common complaint this spring. There are many factors that can cause this but cool dry weather has been a major factor this year. 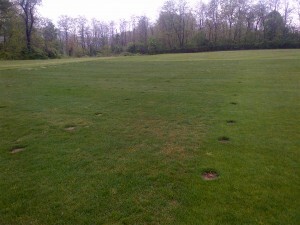 Slow growth of turf can be due to many factors but cool dry weather has been important this spring. But this is changing as I type. The abundant rains of this week will stimulate a lot of shoot growth. Be on the watch for large surges of growth from turfs that have been fertilized with relatively large amounts of nitrogen fertilizer. Water, warmer weather, and nitrogen can stimulate plenty of shoot growth. Moreover, rains could interrupt mowing schedules. Sharp blades and bedknives will be very helpful in cutting fast growing, dense turfs. Overgrown turf will present the greatest challenge to mulching mowers. Raise the cutting height if rains significantly delays mowing and turf becomes severely overgrown. Double cutting may be another useful practice to reduce clipping debris. Avoid mowing turf areas that are squishy wet. Operating equipment under these conditions can cause significant traffic damage to the turf and soil.